"We were hoping that the rest day could help, but in the last 24 hours the situation has become even worse. You can't race in these conditions. I'm really disappointed but this really is the wisest decision." Having dropped out of GC contention in the queen stage, Rigoberto Uran won't take the start of today's stage of the Vuelta a Espana as his astmatic bronchitis has become even worse. Christian Knees have fallen ill and won't take the start either while lymphangitis and bronchitis have taken Haimar Zubeldia out of the race. 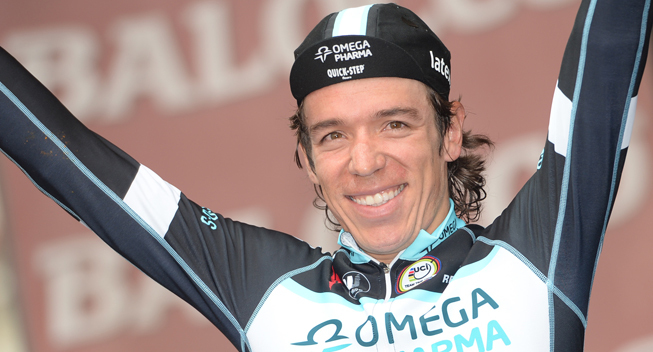 Rigoberto Uran will not take to the start this morning in La Vuelta España, due to asthmatic bronchitis that has been influencing his performance this last week. "We were hoping that the rest day could help, but in the last 24 hours the situation has become even worse," explains Uran. "You can't race in these conditions. I'm really disappointed but this really is the wisest decision." At the beginning of next week Uran will fly to Belgium to undergo further specialist medical exams followed by the team medical staff. "The team and I have agreed that I'll be in Belgium next week to get a better picture of the nature of this problem," Uran said. "Now the objective is to try to recover in time for the World Championships and be useful to the team for the World Championship TTT that will open the rainbow series. Fundamentally I'm in good shape so I'd really like to be there. Of course, my participation will depend on what the test results say these next few days. The team and I don't want to take any risks in the end of the season if the bronchial problems should continue." Meanwhile, Chris Froome has been dealt a blow as Christian Knees has fallen ill and won't start today's stage. The German is a key support rider in windy, flat stages like today's lumpy run along the Galician coast. Finally, Haimar Zubeldia has been suffering from lymphangitis and bronchitis and has been far below his usual level all race. Now the Basque and his Trek team have decided that the best decision is to abandon the race.